If you dont want to get confused then you can download this Rom and flash it via CWM. 1. You need a stock Rom, if you are already on stock rom without any changes no mods and tweaks and if you not then you can download it from here. 2. Choose the model if you dont have a stock rom, download it and copy it to your sd card. then download the stock rom and check your android version you are currently using like I am using Android 4.0.3 and i want to upgrade to 4.0.4 so i download 4.0.3 stock rom. 3. 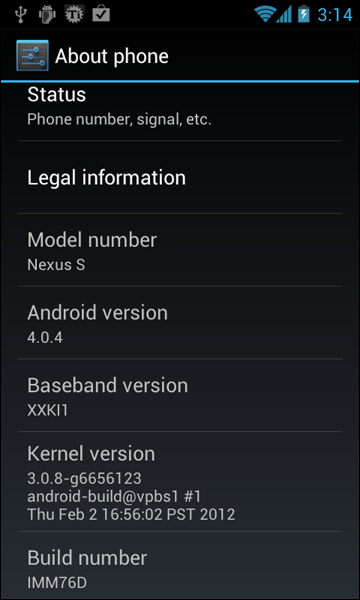 Make sure you are on Stock 4.0.3 or any stock rom and you haven't changed anything in the system. If you have...don't worry...flash the 4.0.3 ROM again. 4. Download 4.0.4 IMM76D from here. The OTA package is around 17MB. Neither of these following OTA updates actually work. Both of them require an unknown radio, and will fail if you try to flash them on a phone running 2.3.3/GRI54 with the XXKB3 baseband. The 2.3.3->2.3.4 update has since been pulled by Google and the link is only provided here for posterity and reference. The only way to properly update 2.3.3/GRI54 is to flash a full ROM over it.